The cell is the basic structural and functional unit of all living organisms. It is a very complex system in which all structure and function interconnected, dependent and controlled of the whole. Sisitem which provides self-reproduction cell a precise copy of its basic structure. Cell simplest organisms are able to carry out all of life’s activities. In complex multicellular organisms, cells are highly specialized and able to perform specific activities. Therefore it is necessary that the cells have the ability to communicate with each other, so that the activities of a group of specialized cells co-ordinated. In this way products of metabolic processes from one group of cells, can be transferred to another group for further metabolism. Each cell in a multicellular organism, perhaps the whole life have total genetic information of the organism. Structural connections between cells is not entirely known. Different possibilities of connection between the cells depend on the types of tissue, of the age, of the functional specificity etc. Besides it is considered that the cells are quite independent of each other. For example, the protoplasts of different cells maintain their independence, and its derivatives may not be available neighboring cells. There are two main types of cell organization: prokaryotic and eukaryotic, which each differ greatly. 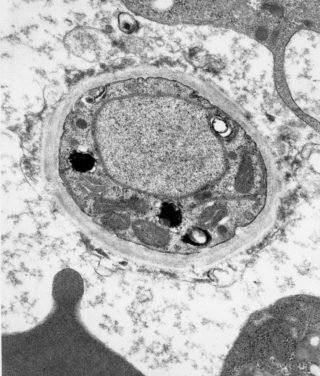 In prokaryotes, which include bacteria and blue-green algae, cells are very small (0.5 – 5 µm). Cells have no nucleus membrane and do not contain clearly formed membrane organelles (mitochondria, chloroplasts, etc.). Prokaryotic genetic information located in a single chromosome, which consists of the double strands of DNA, wrapped in the form of spindle. Nucleus is also deprived of the mitotic apparatus and nucleolus. Prokaryotic cells are enveloped by a membrane cell, which is composed mainly of carbohydrates on the amino acids. Other plant cell organisms, all algae (except blue-green), and all higher plants are eukaryotic type. With very few exceptions, their cells contain the nucleus, Golgi apparatus, plastids etc. which are separated from other content membrane, as well as a developed system of internal membranes known as the endoplasmic reticulum. The nucleus consists of nucleolus and chromosomes, and the number of which depends on the type but is never less than two. Chromosomes are always made up of DNA and histones. Therefore, these cells have the mitotic apparatus that controls a complex succession phenomenon characteristic of cell division.